Six Months Braces offer convenience, especially if you're preparing for a big event when image will be important, like a wedding, family reunion, or job search. You might think it takes great force to move teeth quickly but, actually, it is just the opposite. This proven method involves continuous low force along a specially designed arch wire to comfortably produce results in the teeth that show when you smile. In addition, Six Month Braces require fewer office visits, about one every 30 days, so you save time and money. Of course, we can work with your insurance company or establish a payment plan that will fit your budget without impeding on your lifestyle. That’s right: Six Month Adult Braces. You are not dreaming. You did read that correctly. Six month braces is not a dream, but it can be the answer to the dreams of many patients. As the name implies Six Month Braces is an orthodontic treatment that is completed in 6 months. Allow me to clarify: the great majority of cases are completed in a treatment time of 6 months. Some patients are actually treated in less time. Some very difficult cases can take more time. Even these difficult cases are often treated in just 8 or 9 months. So treatment is completed in 4 to 9 months with most cases being completed in 6 months. Most patients seeking orthodontic treatment are unhappy with the aesthetics of their teeth and want to improve their smile. Six Month Braces are analogous to porcelain veneers, bonding and other cosmetic dentistry procedures. Instead of shaving down the teeth and bonding porcelain or plastic to them, the teeth are gently moved to their most beautiful position. 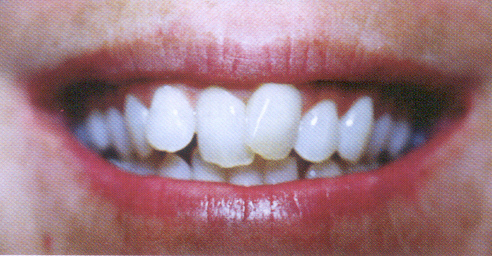 The main focus of treatment is the cosmetics of the visible teeth. This usually creates the desired result – a great smile. 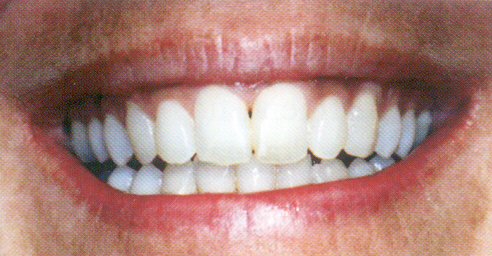 This patient wanted a great smile and she got it…in 5 months! How Do Six Month Braces Work? Six Month Braces are actually a combination of time tested orthodontic techniques that have been put together in a new and exciting way. Some of the techniques have been used for over 60 years and have been well documented in the orthodontic literature. These techniques were put together in the 1980’s and the technologies to implement them have finally been made available. A key ingredient of the Six Month Braces procedure is the use of high-tech wires. These wires exert a light continuous force to gently move the teeth to the desired position. In addition we also use clear or tooth colored brackets and rubber elastics to make our braces less noticeable and more esthetic. A dramatic life-changing result was obtained in this case in just over 7 months. My teeth are all crowded together. Will Six Month Braces work on me? The most common chief complaint of patients seeking orthodontic treatment is crowding. Crowded teeth are treated very well with Six Month Cosmetic Braces. So how do we gain space to fit all the teeth into the arch? Most people with crowded teeth have large teeth in a small jaw, or arch. In many cases simply rounding out and developing the constricted arch will give you enough room to straighten the crowded teeth. Some more severe crowding situations will require gentle polishing between the teeth and is also called enamel slenderizing or reprox. Reprox has a 60-year history in orthodontics. It is a very conservative way to help alleviate crowding, it is painless, it does not increase the incidence of tooth decay or gum disease and it can help increase long term stability of the final result by slightly flattening the contact areas between the teeth. The lower teeth had more crowding than the upper so a combination of reprox and rounding out the arch gave the desired result. Total treatment time was 7 months. Will Six Month Braces Work on Me if I Have Spaces, an Overbite, or an Underbite? Six Month Braces will work on almost any type of situation Other problems that can be treated with Six Month Braces include, but are not limited to open bites, deep bites, anterior crossbites, and teeth that need orthodontics prior to cosmetic bonding or porcelain veneer placement. Are There Any Situations that are Not Recommended for Six Month Braces? There are actually few limitations in regards to Six Month Braces. A situation where Six Month Braces is not recommended would be in the case of a patient who is seeking a dramatic profile change because of a severe overbite or underbite. Often times these cases are best treated with (orthognathic) surgery anyway. Having said that, we will often use Six Month Braces as a sort of “dental camouflage” of their underlying skeletal problems. Do Six Month Braces hurt more than regular braces or do they cause more damage than regular braces? The longer you wear your braces, the more likely you will have root resorbtion. And the higher the force used to move the teeth the higher the chance for root damage. So the answer is NO, since six month braces uses low force over a short period of time. This allows for a very comfortable treatment with a very low likelihood of root resorbtion. Because we use very gentle forces, the discomfort associated with tooth movement is no more and often less than conventional orthodontics.